Season 9 contestant Natalie Yacovazzi returned to NBC’s The Voice stage next, hoping to turn a chair around. Nobody turned around for her last year, but Adam gave her that big piece of advice. Just two sentences, but that’s all it took to drive her to prepare so she could come back this year. On Monday night she performed “Mr. Know It All” by Kelly Clarkson, and Adam turned around almost immediately. It was a poignant moment for her because Adam’s advice had made such an impact. 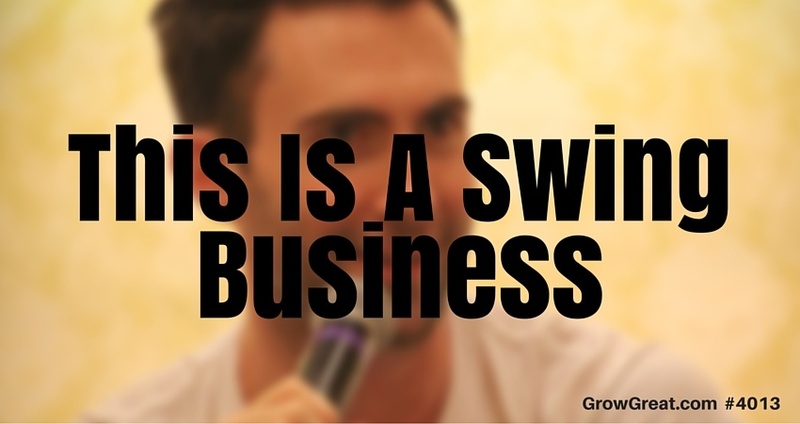 Have you ever held a job or launched a business that wasn’t one where you had to keep swinging? Me neither. Very few – really only the most high profile – CEOs have been on a stage so public as The Voice. Even when they are, they’re not quite performing like a singer does. CEOs do work that isn’t singular. It’s a daily, weekly, monthly, quarterly effort. Rarely is our work judged by a single event – a single performance, or a single decision (unless, of course, the decision is TERRIBLE). Most of us are somewhat seasoned, too. I’ve got 4 decades of work behind me so I’m familiar with the trail, even if a new hole appears every now and again. Many of these contestants on The Voice are quite young. They’re just beginning their trip down the trail. That makes their bravery even more outstanding to me. To walk onto that stage on national TV and expose themselves in such a personal way…it’s enough to make my hands sweat. No chairs turn. Complete, utter rejection. Yes, the judges are mostly kind and they do a great job of trying to give each rejected contestant some advice they can use. Like the advice Adam gave Natalie last year. But still, Natalie said she left last year, after nobody turned their chair, and experienced devastation. I don’t know how long her funk lasted, but kudos to her for getting back in the batter’s box and coming back to take another swing. She didn’t get all four chairs to turn. In fact, only one chair turned around – Adam’s. Natalie’s success – her ability to get on the show and advance one more round – just took one swing and a hit. That’s all you need. Just one win. Sometimes we get caught up in the notion that we have to win really big. It can trip us up because we all want to go big. Nobody wants to go home! Small isn’t insignificant. Small doesn’t have to stay small. Small isn’t failure. On Tuesday I talked about how valuable attempts are. Yes, it’s a theme this week I suppose — brought about mostly because of the people I encounter who are being tripped up thinking their work isn’t important, or productive enough. I don’t mean motion versus action. I mean people who are putting in repeated attempts, garnering some success — and being judged (or judging themselves) as failing. Taking a swing is a baseball metaphor. I’m not a baseball fan, but I appreciate the comparison. In fact, I even went so far to read a pretty interesting article on the value of batting practice (BP) in Major League Baseball. You can’t hit the ball with the bat on your shoulder. It’s a great line. Baseball fan or no, we can all understand how true it is. You have to take a swing. Whether baseball players need to take a hundred practice swing, or just one — who cares? Fact is, professional baseball players have taken hundreds of thousands of swings in their life. They’ve done it so much, been coached so much and developed the muscle memory so fully, they have instincts about it. Keep the bat on your shoulder. Don’t take a swing. Take no action. Risk nothing. Do nothing. Lose nothing. Swinging may not work. Last season Natalie took a swing. Nobody turned around. She was rejected and went home dejected. Yet Adam’s words echoed in her head for months until a new season of The Voice started. As the coaches told her the other night, it takes a braver effort to return a second time because the pressure is even more intense. When you’ve lost once before it’s easy to just quit and say, “I tried, but failed.” Natalie looked deeply inside herself and made a choice to try again. She wanted to take another swing! Full well knowing she might strike out again, but armed with some coaching advice from last season – she also knew she might get somebody to turn around for her. Adam turned around. I don’t know what’s going to happen. Neither does Natalie. Neither does Adam. All we know is that she’s got an opportunity she didn’t have prior to Monday night. One night. One swing. One season later. Tenacity. Resilience. Snarliness. The ability to press on no matter what. Knocked down. Dragged out. Battered and beaten. Those sound bad, but they’re not equal to being defeated. Because failure is just a moment in time if we keep on swinging. As long as we’re working and trying – which is why I got ugly with Yoda – then we’re swinging. Swings don’t equal hits. You can’t get hits if you don’t swing, even though swings don’t guarantee hits. The pressure to get it right – to knock it out of the park – puts too much emphasis on being perfect, or getting it just right. Business people talk of momentum and traction. I’m fond of both words, but I’m not sold that it’s wise for us to emphasize them so much. Momentum and traction can be tough to feel or measure. It’s like examining the economy – sometimes the smallest indicators can show us the way if we’ll just pay close attention. Bigness begins small. Victory begins with a swing. And another. Then another. Contacting the ball matters more than being comfortable watching another good pitch sail past us. Contact starts with trying. Don’t be ashamed of swinging. Don’t be ashamed if you swing and miss. Swing anyway. ‘Cause this is a swing business. All business is swing business. Hitters are first people willing to take a swing. Previous post: 4012 Yoda’s An Idiot. Attempts Do Matter!